Thank you for your interest in the Palmyra-Eagle Area School District. The Palmyra-Eagle Area School District has the advantage of a scenic small town atmosphere with close proximity to urban and suburban areas. Our community is a great place to live, raise a family and send your children to school. We are proud of our accomplishments and our vision for the future and invite you to become a part of the Palmyra-Eagle Area School District. We invite you to contact the District Office or any of our schools if you have any questions. To ensure that students excel with intellect and virtue, inspired by innovative educators who engage and challenge each individual. This year's Prom theme is "Enchanted Forest". The event will be held at Old World Wisconsin in Eagle, WI on Saturday, May 4th. Doors will open at 7:00 pm and all students planning to attend prom will need to arrive by 8:45pm. Grand March and coronation will take place at 9:00 pm sharp! Parents/guardians and the general public are welcome to join us for the Grand March and coronation but are kindly asked to leave promptly thereafter. Students may leave prom, but will not be allowed back in for any reason after they have left. Prom tickets will go on sale starting Wednesday, April 17th during both lunches. Ticket prices are $35 for a single ticket and $65 for a couple ticket. Preferred payment method is cash but checks can be made to Palmyra-Eagle High School. Tickets will only be sold to upperclassmen. 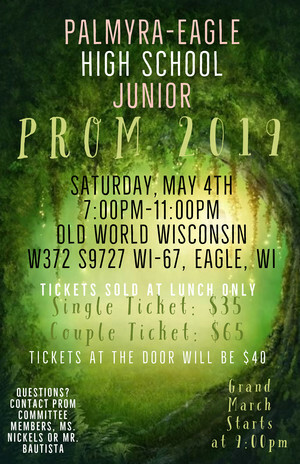 Any ticket sold at the door the day of prom will cost $40. Any guests who are not Palmyra-Eagle High School students will also need to have a guest dance contract signed and turned in to Mr. Bautista by Thursday, May 2nd. Students may get these from the main office. As always, students’ safety is our number one priority. Administration and police personnel will be on site to provide security. Prior to prom, please speak with your students about the dangers of underage drinking and the severe consequences of drinking and driving. Official Referendum results following the Board of Canvassers review are now available. 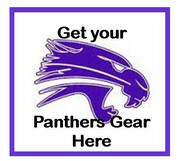 Children in the Palmyra-Eagle Area School District who will be four or five-years-old on or before September 1, 2019, will need to register for the 2019-2020 school year. All parents of children who will be four or five years old and are not currently enrolled at Palmyra or Eagle Elementary schools will need to call or email for registration materials. Please contact your local school office between 8:30 a.m. and 3:30 p.m. to notify the district of your intent to register your child. Parents of Eagle Elementary students are asked to call Mrs. Scheel at 262-594-2148 or email sscheel@peasd.org. Parents of Palmyra Elementary students are asked to contact Mrs. DePorter at 262-495-7103 or email rdeporter@peasd.org. Registration packets will then be mailed to each kindergarten family. Please spread the word to neighbors and friends who may have children eligible for 4-K and 5-K in the fall. We look forward to hearing from you soon! The decision to delay school start time, dismiss school early, or close school for the full day is never taken lightly. Many factors are considered when making such a determination and those factors are weighed in light of the overall safety of our students and staff members. This year’s recent weather has created multiple challenges to everyone’s safety. At this time, a decision has been made to hold school on Monday, February 25 and Monday, April 22, 2019 which had originally been scheduled as teacher inservice days. A regular school day will be held in all three school district buildings on those two days. Lunch will be served on these days. Additionally, a revised middle/high school schedule will be implemented effective on Monday, February 11, 2019 which will result in end of the school day dismissal at 3:02 PM. The decision made is to replace lost instructional time during the remainder of the regularly scheduled school year calendar. Should additional time be needed to comply with State of Wisconsin requirements a review of the time available will be made. This may result in the addition of school days in June if necessary. Your understanding and support of recent decisions to delay or close school is very much appreciated. It is hoped that the plan outlined above causes the least amount of disruption to district families and employees. The Palmyra-Eagle Panthers are seeking community support for our district’s third bi-annual Children with Hair Loss fundraiser. Children with Hair Loss is a national program that partners with schools and businesses to collect hair and monetary donations, to make wigs for children who have lost their hair due to illness. This year, we are proud to say that we have several elementary, middle, high school students and staff members who have vowed to donate at least eight inches of their hair to the Children with Hair Loss organization. On Friday, May 17, at 7:40 a.m., in the Palmyra-Eagle Middle School gym, we will be hosting a hair cutting assembly in which these people will publicly cut their hair for this cause. We welcome any community members interested in this cause to join us at this very special event. On behalf of the students and committee, thank you for your consideration. If you have any questions, please feel free to contact Mrs. Tori Franz: vfranz@peasd.org. Thank you again for your generosity and support of the students in the Palmyra-Eagle Area School District!